We (read: Brigette) are getting really excited about Biltmore’s annual Festival of Flowers, which starts April 4. Brigette and her mom have seen pretty much every nook and cranny at Biltmore, having visited the Estate, and Gardens, the Winery and so on, countless times over the past 10 years. It’s a great place for moms and daughters. The Festival of Flowers is truly a special event at Biltmore and this year’s Festival of Flowers is even more special because a suite of four rooms above the Library, including the Louis XV Room where Cornelia Vanderbilt was born in 1900, and where she delivered her own sons in the 1920s, have just been renovated and will become part of the public tours. Previously, Brigette and her mom toured the rooms as part of the Behind-the-Scenes Tour, and again as part of the Rooftop Tour last May, when the extremely knowledgable Biltmore guide described the renovations in detail (the wallpaper by itself is amazing, so we can’t wait to see what else they’ve done). Biltmore’s Festival of Flowers runs from April 4 through May 17. Not only will visitors be treated to the addition of the four rooms, but also to thousands of tulips in the walled garden, gorgeous flowering azaleas, classical music in the Winter Garden and Walled Garden, live music at River Bend Farm, helpful seminars at Gardener’s Place behind the Conservatory, Red Wine & Chocolate seminars at the Winery, and the list goes on. We’ll be heading there at the beginning of May (our favorite places– the Spring Garden and the Conservatory). 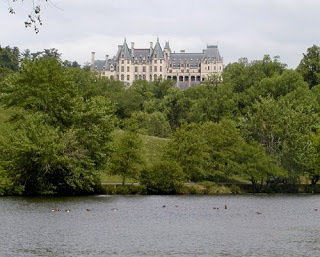 And remember, guests of the Inn on Mill Creek can purchase discounted tickets to Biltmore that are good for two consecutive days, for the price of one-day admission. More information is available on our packages page.